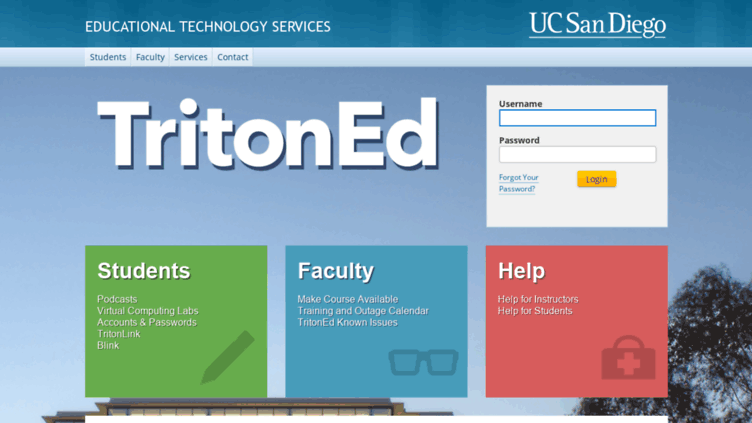 TritonEd, the learning management system currently used by UC San Diego students and faculty alike, is expected to be fully phased out and replaced with Canvas by spring quarter of 2020. According to Educational Technology Services, the decision to transition from TritonEd to Canvas was made due to the input it recieved from a 2017 campus-wide evaluation, to determine whether TritonEd was meeting the needs of students and faculty. In an email to the UCSD Guardian, Director of Educational Technology Services Daniel Suchy, said that the 2017 evaluation, initiated by UCSD’s Chief Information Officer, had both a qualitative interview component and a comprehensive quantitative survey. Over 150 faculty and 1800 students reportedly shared their TritonEd experiences and opinions. According to the Ed Tech website, the survey showed that instructors criticized TritonEd for having an inefficient gradebook system and poor user interface design. Many students felt that evaluating course performance using TritonEd was difficult, its mobile performance was clunky, and faculty use of TritonEd for more than information broadcasting led to feelings of student anxiety and expense. The website also noted that students, faculty, teaching assistants, and Information Technology Services support staff formed ideation groups to help address the issues identified by respondents of the evaluation. ETS made immediate improvements to TritonEd, including integrating Gradescope to streamline the grading of assignments and by creating help tabs that contained answers to frequently asked questions and important university announcements. Suchy said that it is entirely possible that the full adoption of Canvas could come even sooner than Spring Quarter of 2020 depending on how quickly instructors decide to switch. First year Earl Warren College student Aura Celniker told the Guardian that she was not very impressed with Canvas’s performance in her early-adopter course in Chemistry. ETS has already created a complete Canvas support site that includes a training calendar and tips and tricks. During the transition, a single login page will automatically point students to either their TritonEd or Canvas courses. Suchy anticipates that Canvas will ultimately provide a better experience for instructors and students than TritonEd ever did. Victor Flores, a freshman from Eleanor Roosevelt College, said that he’s indifferent about ETS’s decision to switch from TritonEd to Canvas. “I don’t mind [the switch] as long as [Canvas is] as easy or easier to use than TritonEd,” Flores said. Those interested in reading more in-depth details about the transition to Canvas are encouraged by ETS to visit the Ed Tech website.